I was delighted to be asked by Maria Staunton,of GMIT’s Innovation in Business Centre in Castlebar to speak at the first meeting of 2013 of the Mayo Open Coffee Club. I was asked to speak about ‘New Year, New You, Setting Smarter Goals for 2013’. I readily accepted as I have a keen interest in S.M.A.R.T. Goal Setting and I was reading a brilliant book by David Allen called ‘Getting Things Done: How to Achieve Stress Free Productivity‘ which is very readable, practical and makes a lot of sense. Here are the slides (pdf 1MB) I presented on the day. A brief overview of SMART goals – Specific, Measurable, Attainable, Relevant and Timebound – was presented. I used this Goal Setting Worksheet to illustrate how to clearly articulate goals using a SMART format. The template has areas to record who goal is assigned to, and deadlines for meeting them. The first key step is establishing the desired end result. 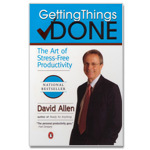 David Allen’s book and his website and podcasts are a fantastic resource to implement his work-life management system that provides concrete solutions for transforming big workloads and uncertainty into an integrated system of stress-free productivity. I certainly agree that GTD is a powerful method to manage commitments, information, and communication. In order to hang out with friends or take a long, aimless walk and truly have nothing on your mind, you’ve got to know where all your actionable items are located, what they are, and that they will wait. And you need to be able to do that in a few seconds, not days. What you need to do is clarify, manage and renegotiate the total inventory of projects and actions that you have to do. Judgement calls need to be made. I also like his explanation of how people get sucked into ‘busy’ and ‘urgent mode’, especially when you have a lot of unprocessed and relatively out of control work on your desk, in your e-mail, and in your mind. I was looking for a nice conclusion to my slides so I picked a quote from the final lines of the second last chapter. A comment that really echoed with me from the book was that when you get a reputation for getting things done and you will be asked to do more! Please contact me if your organisation requires assistance with Strategy Development; Goal Formulation or Execution Planning.